Last March we abandoned our website. For those of you keeping track, that would be March of 2018. We don't have any excuses for this, but we did find it fairly easy to do. It turns out that not writing anything and not posting anything requires very little effort. We're pretty sure we could do it for months on end. Pictures are similarly easy to not take, and indeed we found this the most satisfying part of the entire exercise. We really like not taking pictures. Even with our unjustifiable desertion from the website, we still drove the Locost almost daily, and in fact we still do. We don't have any pictures of this of course, but the car looks about the same as it did last March, so use your imagination. The primary reasons the car looks the same are a) we didn't work on it very often, and b) we didn't crash it. We also didn't do a lot of other things we said we would, like for instance paint the bonnet or recover the seats. We did fix the brakes. Most of you wouldn't know this because we never found a good way to break the news, but the master cylinder on the Locost leaked from day one. We put up with it for five years, because the master cylinder is non-removable. 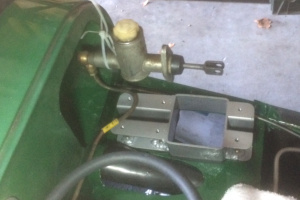 When we built the car, we bolted on the master cylinder first, then threw on a scuttle, a dashboard, steering column, tubing, wiring, and various other bits and pieces that combined to make the master cylinder a permanent fixture of the assembly. So we put up with the leak, and the brakes would almost always work, except when the fluid reservoir would drain completely out. 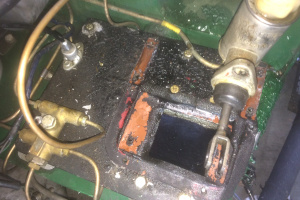 We didn't notice this happening so much in the old days, before the engine rebuild, because back then we had to check the oil every five minutes, and that tended to provide us with the opportunity to keep the brake reservoir topped up. Unfortunately, once we rebuilt the engine, our oil consumption dropped to zero and the reservoir would empty itself fairly often, like for example any time we went a couple of weeks without popping the bonnet. Losing the brakes was generally a manageable affair, but the mess left behind by the leak was not. Paint on the pedal box, firewall, and engine bay shelf all wrinkled like a prune and peeled like a grape. 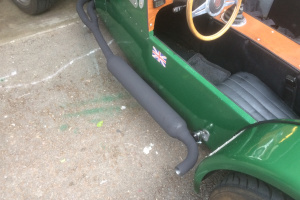 This was easy enough to hide with a tightly latched bonnet, but the fluid would also seep out onto the driver's side bodywork, making a mess there. Over the years, when it got really bad, we'd clean it up and repaint it with a brush, a fix that would last at best a week. So you can see now why we never brought this up, especially knowing as we did that the leak would be impossible to fix. Instead we just tried to live with it, making a habit of checking the reservoir on a regular basis, repainting the side of the car once a month, and familiarizing ourselves with the use of the emergency brake. But the leak wasn't satisfied. Unable to leave well enough alone, and no longer content to simply dump the contents of the fluid reservoir all over the engine bay, pedals, carpet, and bodywork, the leak, as they often do, got worse. When it got so bad that we could fill the reservoir at night and find a giant puddle of brake fluid on the carpet the next morning, we knew we had to do something. So we ordered a new brake master cylinder from Moss Motors, and when it arrived we set it on a shelf, where we could stare at it wistfully and imagine how great it would be to have the thing installed in the Locost. Unfortunately, there was that whole non-removable business, so buying a new brake master cylinder and setting it on a shelf proved to be an incomplete solution at best. Eventually, when it became apparent that we could no longer drive the Locost for any significant distance with more than a fifty-fifty chance of arriving safely at our destination, we parked the car in the garage and left it there. We weren't happy with the decision, obviously, and we fretted about it for a long time, at least several hours. When we finally realized we couldn't take it any longer, we marched out into the garage and popped the bonnet, then started blindly tearing apart the pedal box. 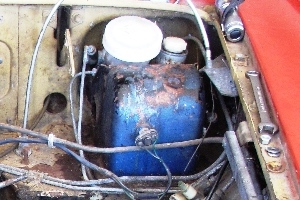 The pedal box, lifted from a 1972 MGB, was attached with eight bolts. This is about double what it needs, but it's British. 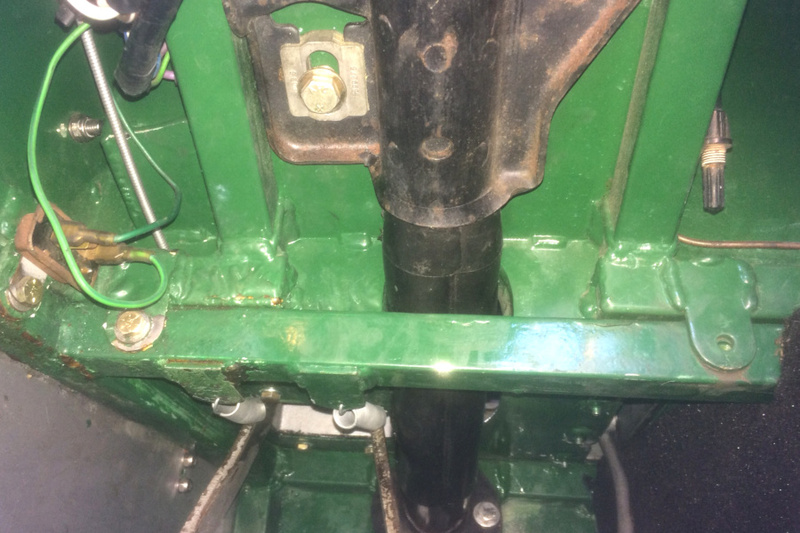 Six of the bolts were easy to remove, as they screw into captive nuts that we thoughtfully welded on to the bottom of the pedal box platform when we built the car five years ago. The last two bolts were also screwed into captive nuts, but not ours. These nuts were part of the pedal box itself, and were used in the MGB to attach the rear of the pedal box to the firewall. If you're more than around three feet tall, maybe a little less, you cannot climb under the dash in the Locost. You can do the next best thing, however, which is to twist your back in a painful contortion that leaves your head under the steering wheel and your feet draped over the side of the car. From this angle you can see absolutely nothing of the nuts and bolts that attach any of the under dash parts to the firewall, because they're all tucked away behind the massive steering column mount, which takes up around ninety percent of the space down there. If you reach under the dash, working your fingers around the steering column mount and through the maze of wiring behind it, you can just feel the heads of the last two bolts that attach the pedal box to the firewall. We didn't know this earlier, because we'd never tried to find them before. But as we lay there considering various destructive ways to remove them, it occurred to us that if we could feel the heads of the bolts, it might be possible to slip a box-end wrench or something similar over them, and loosen them up. Imagine our surprise when this worked, and the bolts dropped out and fell to the floor. When we built the Locost, we never got that lucky. If a task turned out to be impossible, we simply didn't do it. We used instead what we called 'options' to come up with a different idea. Back then we always had options. We couldn't have built the car without them. We even had options with the leaky master cylinder, our primary one being to paint the car every month and practice modulating the emergency brake. That turned out to be a pretty good option until the master cylinder stopped working altogether. When we finally got those last two invisible bolts out, it was like a miracle had occurred. We couldn't believe it. After five long years in captivity, buried deep in the engine bay and slowly dissolving under a cascade of wanton brake fluid, the pedal box was finally free. We never thought we'd see the day. Our grandchildren, maybe, but not us. With the pedal box out, we figured we could easily remove the leaky master cylinder from the pedal box, bolt in the new one from Moss Motors, and then screw everything back together in a single afternoon. Except we couldn't. Because even worse than the mottled paint on the crusty pedal box was the wrinkled mess on the pedal platform and firewall. It was a disaster. The paint peeled off in sheets, a slimy, slippery film of brake fluid clinging to the metal underneath. So we got out a bucket of soap and hot water, scrubbed the entire engine bay clean, peeled off the last of the ruined paint, and then sanded everything down. We spray painted all of the loose pieces in their original colors, and brushed on Rustoleum Hunter Green all over the engine bay. 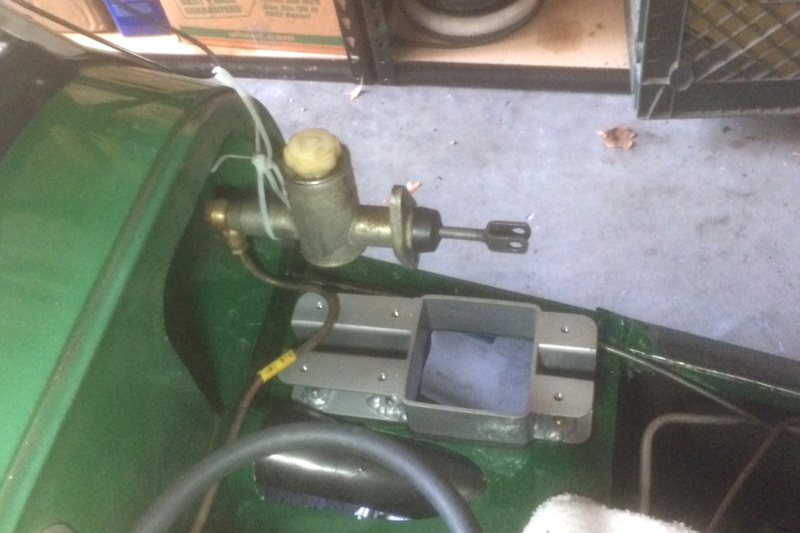 We let the whole thing dry for a week, no doubt a record for us, then reassembled the brake and clutch pedals in just a few short hours on a quiet Saturday morning. We made very few mistakes in the process, most of which were easily corrected. Unfortunately, in the end it turned out we were only able to reattach one of the two invisible pedal box bolts, as we were unable to locate the hole in the firewall for the second bolt with our fingers. We believe the hole is still there, but maybe just beyond our reach. Not a deal-breaker in any case. So the brakes are back together, notwithstanding the one superfluous bolt. 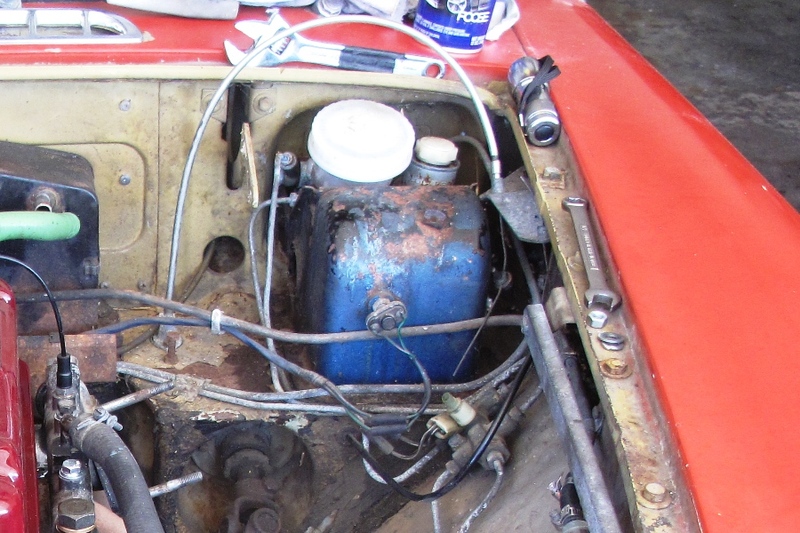 The engine bay looks a lot nicer with its fresh paint, and the master cylinder is retaining fluid, possibly for the first time ever, at least in the modern Locost era. We haven't actually looked under the bonnet to verify this, but we haven't added a drop of hydraulic fluid in weeks, and the brakes still work. Also, the carpet's dry. All good signs. Right now the Locost is probably in the best shape it's been in its life. We're really thrilled with it. 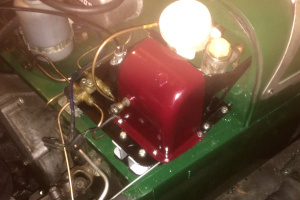 The engine is running flawlessly since replacing the cylinder head last spring, and the paint is still in great shape. We also finished the new exhaust a few months ago, and it's much quieter now. Not as subdued as we'd hoped, but certainly more civilized. We didn't do anything with the interior yet, but we think the carpets look terrific when they're not soaked in brake fluid. We didn't realize it before, but paint constantly dissolving on the driver's side of the car was a real bummer. We don't think we'll ever stop driving the Locost. It's just too much fun. We'll also probably keep tinkering with it, because we like doing that too, and we have a couple of projects still in the hopper. We're not sure we'll be back on the website, though. We think the story's probably been told by now. But we'll keep the website up and running, so long as we can afford it, in the ongoing hope that we might spark a little interest in the car-building hobby, and maybe encourage at least a couple of people in that direction along the way.